Wide based foot pads on every leg ensure a dependable sturdy base and easy access to secure anchor points. 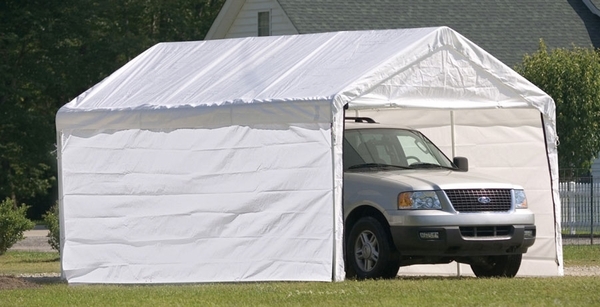 Need a heavy-duty field tested shelter you can depend on for years to come? This 10' x 20' Commercial Grade Canopy Shelter from Shelter Logic is the answer. Its durable beam-welded, 22 gauge, 2" diameter steel frame is tempered with the Rhino Shield process and then bonded with baked-on DuPont thermoset finish. 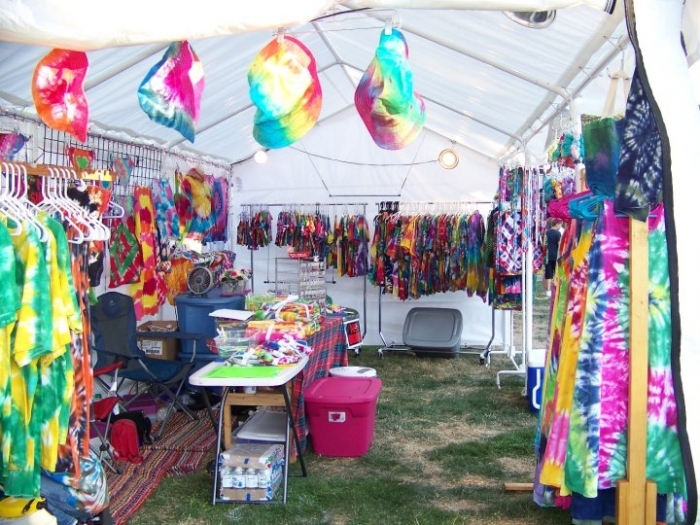 The one-piece, full valance cover is UV treated to prevent fading, aging, or fungus. It's also totally tear resistant, and constructed from 100% waterproof polyethylene. With a 10 year life expectancy, this portable tent is a whole lot more durable than you think. 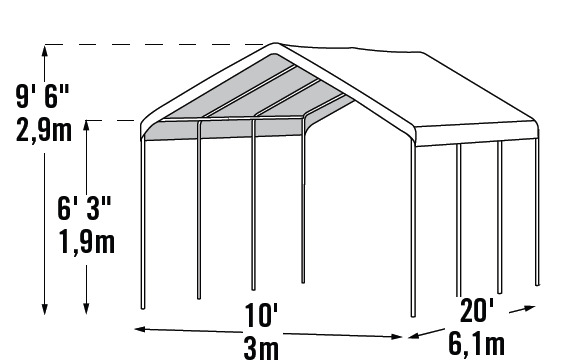 Choose quality with this high-grade canopy from Shelter Logic. Also, I need the front part. It has holes in it, and one of the zippers no longer works to protect my 1952 vehicle. Thank you. You will need to contact ShelterLogic directly. Does this style come in 12' x 24' and what are the different heights available? We do not currently offer a 12' x 24' in the same style that allows you to have just the top in place. The next closest we have is the ShelterLogic 12 x 20 Super Max Commercial Grade 8 Leg Canopy Shelter . Is this available in tan/brown? Do you offer heavier covers? No. I apologize, but we are unable to get a heavier cover. What grade (oz) is the cover? The cover is 5.5 oz or 13 mil. We bought this tent for a constructions site and so far it is performing as expected. Service was fast. Arrived before the delivery date. ProsWorks great for our construction site. Awesome service and delivery. Love my canopy! Pros Easy to put together and anchor down! ( once we made the trip to the hardware store for the pins for the frame ). ConsNot enough pins to put frame together- ONLY 6!! Put the roof and sides up in two hours had to build a floor so left the ends off. Finished the floor put my 1958 tr3 and tools inside. Hooked up some electric and was able to work on my car during a snow storm. Kept the snow off the roof and it held up fine with 16 inches coming down. There a less expensive one of these but with the 2 inch pipe it seems well worthwhile. Would recommend this two anyone who wants more than a temporary shelter. I'll get another of these, IF this one ever wears out! I ordered it online and it came via freight truck to the end of my road, where the driver and I loaded it into the back of my pickup. It is a great tent. 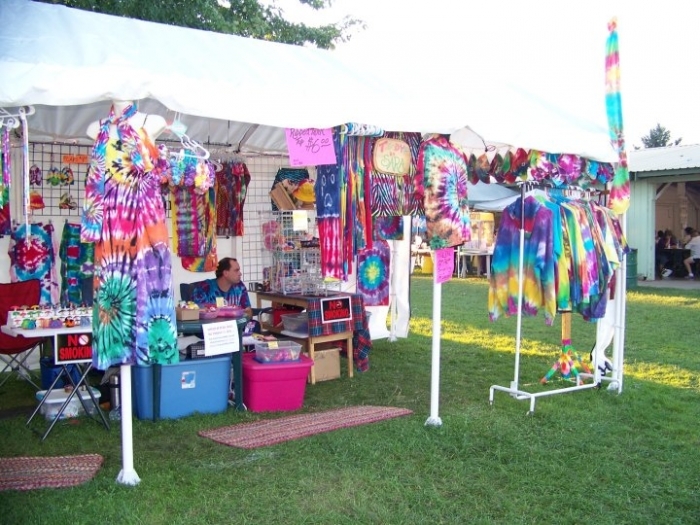 We sell tie dye during the summer at festivals and it has been so reliable. This will be our fourth year with it. I love the sun shelter it provides. It has saved me more than once from heat stroke in the middle of the huge open fields where our festivals are often held. (I got sick the year before I got this, because my previous set up didn't provide more than a thick mesh for cover from rain and sun. It holds up to light wind gusts of about 10-15 mph which completely twisted my previous shelters into knots. ProsRain proof, sun proof and so sturdy! Placed my order on line received item in 5 days. Due to delivery times someone had to be home to sign for it . It arrived in good condition. Had it up and in use in a little over 2 hrs. Consdelivery came by semi-truck and I live on a long gravel driveway with limited turn around ! It all worked out.